Paint on the wooden base of the music box contains excessive levels of lead. 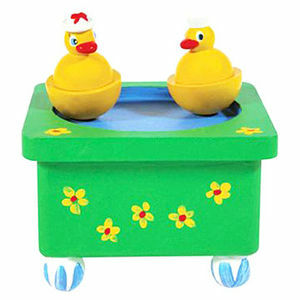 This recall involves about 1,300 Dizzy Ducks Music Box, which is a wind-up music box with ducks that spin as music plays. Specialty toy stores and gift shops nationwide from March 2007 through October 2007 for about $12. Take the recalled toy away from children immediately and contact Schylling to receive a refund or free replacement toy. For more information, contact Schylling at (800) 767-8697 between 9 a.m. and 5 p.m. ET Monday through Friday, or visit their Web site at www.schylling.com.